Good opening preparation makes up to 60% of your overall success, according to statistics. If you don't know your openings, you won't get a playable position and your chances will plummet. Why do some players effortlessly obtain a great position out of the opening, while most others struggle every step of the way? Those players seem to make the RIGHT MOVE at the RIGHT TIME, instinctively without needing to think about it. They know what each piece is doing, and exactly where and when to attack. They see possibilities no one else can and exploit them to score easy wins. The craziest thing of all? They seem to do it without even trying. They just play - and dominate. Every single game. The successful players KNOW the openings they play. Not just the move orders. Not just the basics. But the plans, maneuvers, ideas, tactical patterns, key squares, and everything else in between. These players understand those positions much better than their opponents. And we give you just that! Instead of analyzing everything over-the-board, as your opponents will do, you'll use your home preparation to get a serious edge both on the clock and on the board! The course is designed with 1500-2200 rated players in mind. The "ideal student" is a club level player who wants to add a powerful, yet "low-theory" weapon against 1.e4 in his repertoire, sufficient for outplaying 2300 rated players. The course covers all most popular responses by white including the Modern Variation, Knight Variation, and the Maroczy Bind. It gives you a detailed explanation of the plans and ideas behind the opening for different types of typical positions. Kan Sicilian is included in repertoires of many top players including Anatoly Karpov, Vladimir Kramnik, Magnus Carlsen, and recently Fabiano Caruana. It'll be a great addition for your repertoire as well! In this 22-lessons, 10-hour course, NM Neustroev gives you a powerful yet low-theory opening repertoire against 1.e4 based on Kan Variation of Sicilian Defense. It gives you a detailed explanation of the plans and ideas behind the opening for different types of typical positions, sufficient to get an edge against most under 2300 players. Downloadable, complete set of PGNs of all the games and opening theory covered in the course. Each lecture comes with a separate PGN file for your convenience and ease of navigation. Powerful novelties included, to surprise those titled players. Advanced training tasks are included to make sure you grasp the most important ideas of the Kan Variation, able to find the best moves and right continuations in actual games. Watch NM Viktor Neustroev playing live and applying principles and ideas covered in the course. NM Neustroev annotates the games on-the-fly, sharing his ideas and secrets of success. Almost 2 hours of extra materials. 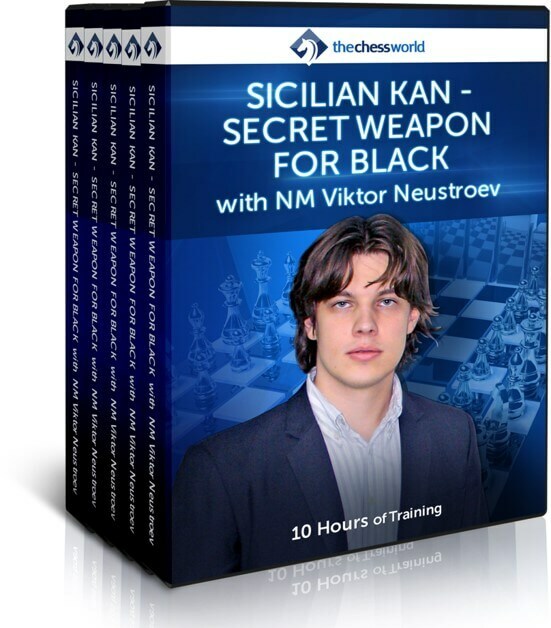 A must-have for any serious chess player. This 3-hour course teaches you subtleties and nuances of Grandmaster Thinking, and most importantly how you can copy and paste some of those methods and techniques into your own games! A great complimentary material for the Kan Sicilian! is a chess player and coach who won multiple regional competition and received various awards. He has coached for many year and have had highly successful students. Viktor sees his mission in teaching chess and making his students overall much better players.